From the start of the 12th century. Italian architecture was characterized by many different aspirations, which combined to create an architectural culture of great vitality and a striking geographical diversity. On the one hand Franco-Burgundian influences began to filter through with the foundation of Cistercian monasteries, from Chiaravalle to Fossanova, and were partially adopted by new orders, in particular the frugal Franciscans and Dominicans. Challenging these ideas was the tenacious Romanesque tradition, which was well able to cater for the needs of the new city states. This was the case in the Po Valley of northern Italy, although the church of Sant'Andrea in Vercelli and the top colonnade of the Baptistry of Parma already showed concessions to the new style from the north side of the Alps. Another important influence on Italian architecture was offered by the classical heritage, dominated by the early Christian basilicas in Rome, and in the Imperial revivals in Italy, splendidly interpreted by Frederick II of Germany (1194-1250). who was crowned emperor of Rome in 1220. This complex combination of influences was profoundly interlinked with equally multifaceted developments in other Italian art forms, making it difficult to recognize coherent and unambiguous patterns. From a historical point of view. 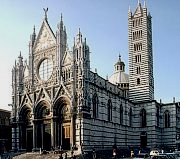 Gothic represented a distinct change, which counteracts the traditional understanding of an uninterrupted transition from the Romanesque to the Renaissance (epitomized by the work of Brunelleschi). By the 13th century, the Franciscan and Dominican orders, together with the Humiliati. a penitential association of the laity specific to the Po Valley, were pushing for simpler constructions and more usable space. 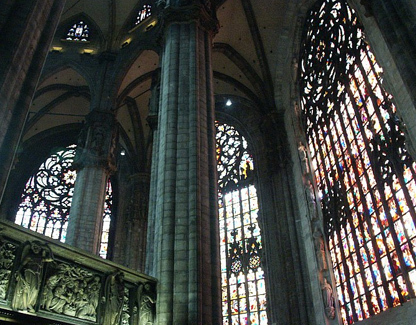 As a result, the ceilings of nave and aisles. whether vaulted or wooden, were adjusted to reduce the differences in height between the side aisles, while the widely spaced pillars gradually diminished the excessive mix of straight and curved lines by the use of wide-diameter arches, either pointed or completely rounded. The result was a geometric architectonic image that was rationally coherent in design. The surrounding walls became a surface for the multicoloured decorations of cycles of legendary scenes, which were either painted on, as in the buildings at Assisi, or sculpted, as in the facade of Siena Cathedral. Seen from this point of view, Giotto's bell-tower in Florence represented an extraordinary return to the integrity of surface articulation. Despite the obvious French influences in the Upper church of Assisi or in San Francesco, Bologna, with its radial chapels around the choir, the Dominicans and Franciscans consciously respected civic needs and erected buildings of strong public character, as is clear in Santa Maria Novella and Santa Croce in Florence. 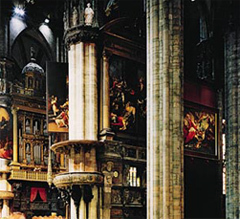 Out of this situation the image of the civic cathedral took shape: from Siena to Orvieto, Lecce, and Bologna. 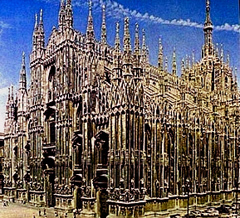 Milan provided an opportunity for later revisions of the French innovations, especially as regards decoration (triforia, rose-windows, spires, pinnacles). Other integrations are beautifully exemplified by the crowning of the Baptistry of Pisa and its neighbouring cemetery, the Camposanto. 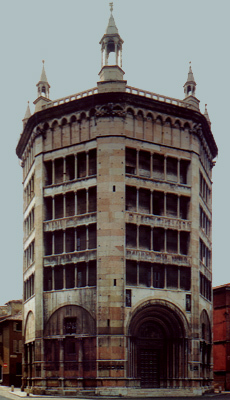 That these developments were closely modelled on the art of goldsmiths is evident in the two great facades of Orvieto and Siena, with the micro-architecture of ciboria (dome-shaped canopies above the high altar), pulpits, and funerary monuments - works in which artists such as Giovanni Pisano (c.1248- 1314) and Arnolfo di Cambio participated. Also characteristic of the new age was the versatility of great architects who were generally competent artists in a wide range of different fields, including draughtsmanship. 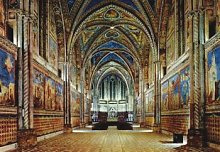 Such artists include Giotto and Arnolfo di Cambio in Florence, and Giovanni Pisano in Siena. 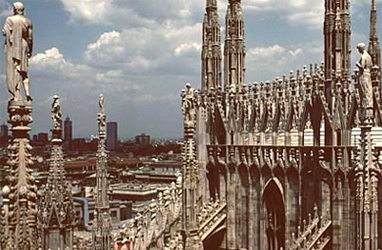 The Italian cities developed rapidly to reach economic independence and this fostered numerous new civic buildings with a versatile mixture of Gothic pinnacles, colonnaded porticos, and sculptural detail. Clustered around the central square, magnificent town halls, hospitals, and urban palazzos were built, and work continued on the cathedrals. Echoes of classical architecture, which retained vestiges of the ancient rules of proportion, was strongest in Rome. It was also seen at the court of Frederick, which in Castel del Monte interpreted Cistercian Gothic in noble, classical forms. The octagonal cathedral crossings provided a monumental example, which was to extend the geometric styles beyond the confines of the cathedral, to be applied to the fountains of city squares. It is also in the cathedrals of Pisa. 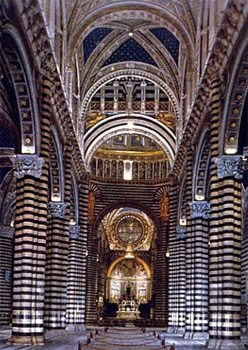 Siena, and Ancona that another example of geometric order emerges: the cupola set above the transept and the body of the nave. 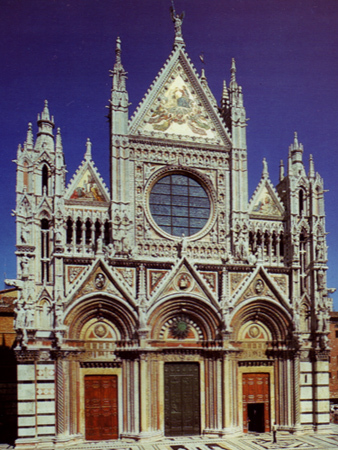 Facade of Siena Cathedral, built and reworked from 1284 to 1382. 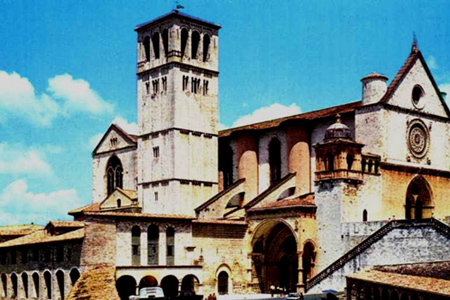 In 1228, the Basilica di San Francesco was begun in Assisi, two years after the saint's death. This long building project revealed the bitter quarrel between those who adhered strictly to St Francis's ideals of poverty - evident even in the first paintings of him in the Sacro Speco at Subiano - and those who supported the inclusion of the Franciscan phenomenon in the affairs of the Church. Unlike St Bernard, who had founded the Cistercian Order in the 12th century, St Francis had not introduced aesthetic ideals into new monastic foundations, but went about restoring small rural oratories. Otherwise, the brothers' work was purely mendicant. 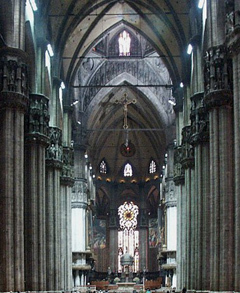 The building had the triple function of a burial place, a conventual church, and a papal chapel. The Lower Church, which perhaps represented the first phase, was soon followed by the more ambitious project of the Upper Church, which was rich in French Gothic elements, such as Angers cathedral and the unified space of episcopal chapels. The building itself stressed the relationship between his preaching mission, and Christ's mission, which was also emphasized in Giotto's cycle of frescos, the Life ofSt Francis, as well as by Dante in Canto XI of Paradiso in his Divine Comedy. Franciscan architecture soon gained a hold throughout Roman Catholic Europe. Favouring wide, well-lit spaces, walls were decorated with scenes from the Passion, the Nativity, the Life of the Virgin, saints, and the beatified who encouraged a life of charity. 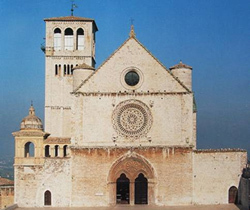 Franciscan convents and churches were prominent in the cities and it was here that many great artists worked, from Giotto to Piero della Francesca, and from Leonardo to Titian. Vying with the Dominicans, the Franciscans were philosophers and theologians, teaching in the universities and influencing the culture of the courts. View of the Upper Church towards the apse, Basilica di San Francesco, Assisi. 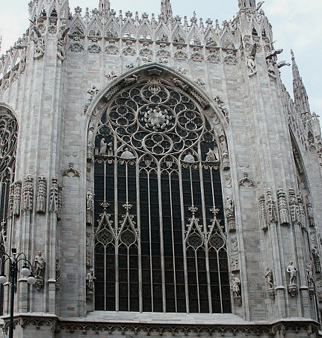 The capitals of Milan Cathedral and the Pilasters of the Angels testify to the great constant of Gothic cathedrals — the close relationship between architecture and sculpture. This is not merely decoiatne, but is of great iconographic meaning. 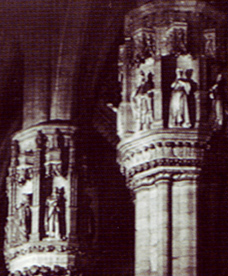 The Pilasters of the Angels, inside the portals of the transept of Strasbourg Cathedral, date from 1220 to 1225. The sculptor, who had probably worked on the site at Chartres, placed the angels inside false-niches formed by Gothic-brackets and pediments made to represent the city. 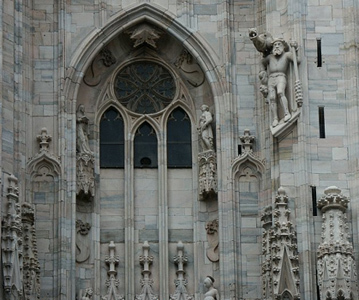 This figurative tradition, widespread on the portals and facades of the cathedrals, was to find a new application in the capitals of Milan Cathedral. 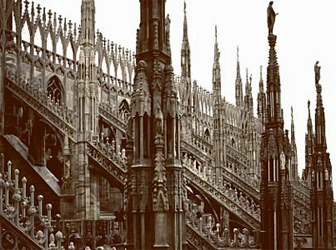 Completed at the end of the 14th century to designs by Giovannino De' Grassi, they were criticized by the Frenchman Jean Mignot. However, the church authorities replied that they respected proportions analogous to Vitruvian rationality, and that their decorative merit was strictly related to the iconography. The "Gallery of Saints" was transferred from the portals and facades to the pilasters, where it lined the pathway of the faithful to the altar. Begun in the 1380's on a site where several churches had existed earlier, the building of this cathedral was fraught with difficulties. 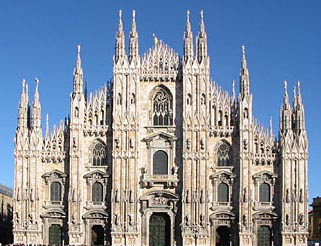 Over a number of years several different architects and consultants (including Leonardo and Bramante) were asked to work on the design.The cathedral is white marble, over a brick core, and has a cruciform plan. One of the largest cathedrals in the world (14,000 square yards) it was designed to accommodate 40,000 worshippers. The forest of pinnacles, the tracery panels, and the rich embellishment with statuary identifies it as Late Gothic. Closer to France than most Italian cathedrals, it borrows more directly from the French "rayonnant" style.